1 July - A dry, cool morning with broken high cloud, and just enough sunshine to make the Nipplewort think about opening its flowers. 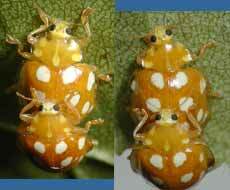 Down on the Birch tree (at 8am) the life cycle of the Orange Ladybirds continues with two pairs of adults mating. Of all the leaves on the tree, they have chosen to come to this one spot. I cannot see any other adults elsewhere. The black backround results form my use of fast shutter speeds and flash. The movement of the tree in the breeze meant that slower shutter speeds could not be used. Here are a few close-ups of the lower of the two pairs. Unlike the other pair, these were on the move almost continuously. The leaves they are on are about 6ft off the ground, about the same height that I have found all the egg clusters so far. 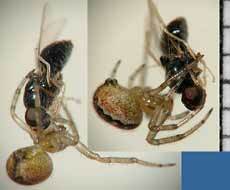 I shall be watching for the moment when the females start laying eggs resulting from this mating. In these images of the pairs, it is interesting to compare the very limited variation in their markings, although there does seem to be a slight difference between the head colourings of the sexes. The male heads seem to have a slightly paler 'face' than their partners, although this may be caused by them being at a different angle to the camera and flashgun. 2 July - Today has been a day of April showers, the like of which we didn't see in April! We have had over an inch of rain and the temperature has struggled to pass 18C. Just before 9pm the sun peeped under the cloud base as it set and produced a brilliant rainbow to the East of us. It was a complete semicircle, but I'm afraid it was just too big to capture in one image, so here are the two ends, criss-crossing telephone cables that radiate out from a pole couple of houses down from us. 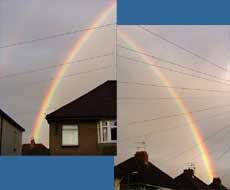 For a short time there was a feint second rainbow which can just be made out in the left-hand image. During a dry spell I went out to buy some peat-free compost to do some re-potting/splitting of our bamboo plants, needless to say, that job is on hold. I have been keeping an eye on the nymph that I first recorded on 26 June. 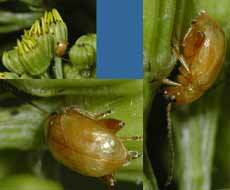 It has remained on the same leaf ever since, and the right hand image shows its appearance yesterday. 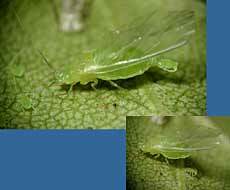 At 3pm this afternoon on that same leaf I found an adult leafhopper right next to a cast-off skin. It looks as though the nymph has matured. 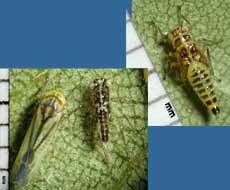 I assume that the leafhopper's colour will change gradually after emerging, and hopefully it will still be in the same part of the tree tomorrow morning. The dark bands on the wings are similar to those on Edwardsiana geometrica, although the scutellum ( the small triangular area between the fronts of the wings) isn't a match, being all dark in E. geometrica. 3 July - A windy, but largely dry day, and I managed to get one of the bamboos re-potted. Even the windy blowing didn't stop life going on in the Birch tree this morning, although it did make for difficult photography as the tree swayed constantly. First of all, there was this Orange Ladybird larva that had just moulted. 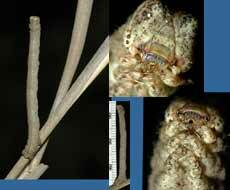 It was holding itself away from the leaf as its soft exoskeleton took up its new shape/size. I should point out that the photograph is upside-down, as are most of the pictures taken on these leaves. I have been watching out for the adults egg laying - no luck as yet, but a few new clusters of eggs have appeared today. 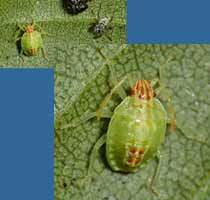 While the Ladybirds, and most other insects lay eggs, the Greenfly has a distinct advantage when it come to giving the offspring a good start - the young are born live and ready to go. Here, a young one is delivered as two of its siblings are already on their way to a suitable feeding spot. The small image shows it on the leaf surface, although I couldn't get a clear image of it as the tree moved. I have neglected the spiders so far this year, but while Greenfly was delivering on a Birch leaf, just about a foot away, by the tree trunk, a small spider was setting about wrapping up a snack for later. It looks like a Garden Spider (Araneus diadematus). Later in the morning I caught sight of this hoverfly on one of the Marigolds that have grown form the wild flower seeds sown in front of the shed. The images are not as sharp as I would have liked, but again, I'll blame that on the breeze. 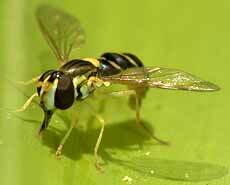 It doesn't appear in my insect guided but a look at several websites suggests that it belongs to the genus Sphaerophoria. 4 July - On a day that has stayed almost completely dry, I have only taken photographs of one of the garden's inhabitants. It's a Mirid Bug Campyloneura virgula which I last recorded in the diary just a week ago on 26 June. 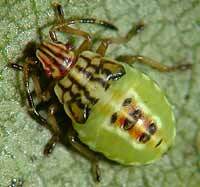 On this occasion I had the chance to record it as it fed on an aphid (on a Forsythia leaf). 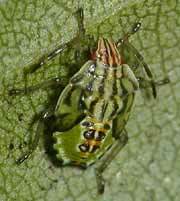 You can see the bug's piercing beak (rostrum) inserted into the aphid as fluids were sucked out of its body. This evening saw a heavy shower that was followed by another super rainbow. 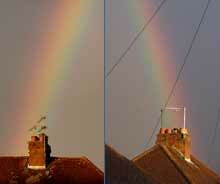 It was almost a case of 'which chimney has the pot of gold?'! 5 & 6 July - On these two days we had good weather, and I completed the task of splitting and transplanting the bamboos into a set of square pots so that they can be used as a screen down the West Wing (the bottom of the garden). 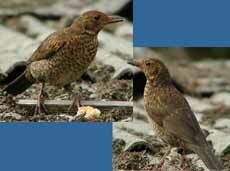 On the 5th I saw a juvenile Blackbird for the first time this year. It was calling to be fed but moved into cover before a parent turned up. I'm afraid I can't claim this one as a success for the garden as the Blackbirds failed in their nesting here this year. 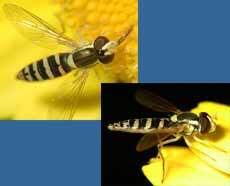 During a pause in my gardening I took a few pictures of what I think is the same species of hoverfly that I noted on the 3rd. 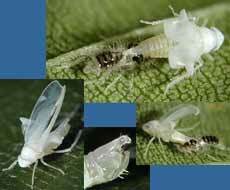 This time it was on a bamboo leaf, lapping up the honeydew produced by aphids. Finally, I had to look twice when I saw this twig change its posture on a dead bit of bamboo. It turned out to be a caterpillar using a fantastic combination of perfect colour match and mimicry. The right hand images are close-ups of the front (anterior) end. In the top one you can see its jaws, and in the lower one you may just make out its three pairs of true legs held close against the body. I do not know what species it is, but it will be a member of the Geometridae family of moths. First thing yesterday the loudest sound in the garden was being produced by this male Blackbird as he proclaimed his territory in response to another, calling from further down the road. He obviously hadn't spent too much time over his personal appearance. In contrast to his loud presence, a couple of trees away, Starlings and Sparrows were being much more laid back while enjoying the bright sunshine. These two spent ages preening, and equally long sunbathing with wings and tail feathers spread towards the sun. The bright sunshine also brought a few butterflies (at last! 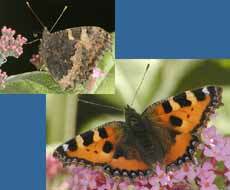 ), two of which were attracted by our Buddleia which is now in flower. 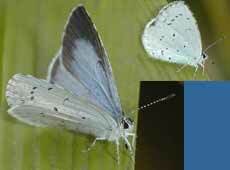 The first was this Holly Blue, although it didn't go to the flowers, instead choosing to sunbathe on a leaf. 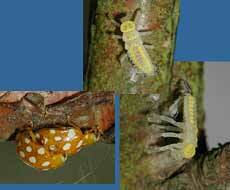 These pictures were taken when it moved to a bamboo leaf. The broad dark band on the wing indicates that it is a female. This Small Tortoiseshell was one of two that did spend quite some time feeding at the Buddleia flowers. While this one looked fresh, the other visitor looked very worn indeed, with many of its wing scales rubbed off. My last photograph of the day was taken yesterday evening, although the subject is still on the same Birch leaf this morning(7th). Only 4mm in length, it is nevertheless quite a striking creature with the bold red stripes on its head! I have yet to try to identify it. 7 July - This morning the sun is trying to peep through a lot of high level grey cloud and by the end of the afternoon we are promised heavy rain and high South-easterly winds as a low pressure system moves up from Spain. The morning's Daily Telegraph newspaper describes it as 'November gales blowing in today' and there is the suggestion that we may get the most rain on a July day since 1945! The wind speed has been increasing during the morning, with gusts already reaching 30mph, but at 11am it was still bright and warm enough to sit outside. 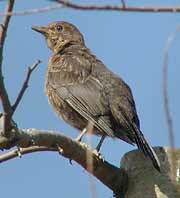 While we were down the West Wing I had another chance to photograph a Blackbird juvenile. This time it landed on my neighbour's shed roof with a piece of bread(?). 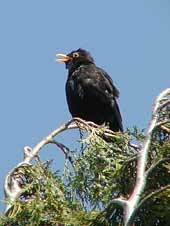 While we sat we were also treated to choruses from the adult male Blackbird and a Greenfinch. In contrast to yesterday's butterfly pictures, this was the nearest I could get to photographing a Comma as it sheltered from the wind amongst Weigela leaves on the far side of the pond. A Small Tortoiseshell has found refuge in our lounge, and I will not be putting it back outside until tomorrow. As the wind increased I was interested to see how the Orange Ladybird larvae would react. As time went on more and more of them migrated from the leaves to more secure spots, beneath thicker branches or by branch nodes. 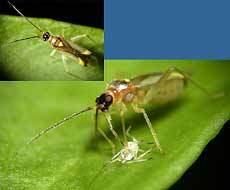 In the left-hand image you can see a Mirid bug that is sharing the sheltered spot. By lunchtime I could only see a few of the smallest larvae still on leaves, which is good as the wind has started tearing leaves off the tree. However, the adverse conditions are not preventing the essentials of life from continuing. 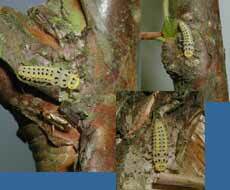 When I first saw it, the larva in the left-hand image was hanging by its tail as it completed a mould. Fortunately it was securely attached and it was soon able to grab hold of the bark. I saw a number of adult ladybird sheltering under branches, and the blustery conditions didn't prevent this pair meeting up and begin mating! 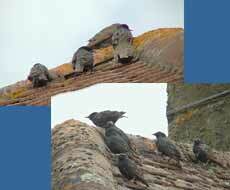 For the birds it has also become a case of finding places to shelter from the stronger gusts. Here, two groups of Starlings wait on the Western side of the rooftop for a quieter moment so that they can continue their search for food. Notice how both groups have a 'leader' who seems to be braving the East wind. By 3pm the rain had arrived, the wind had eased a bit, and the birds were back at the feeders. 8 July - We have had a couple of heavy showers today, but other than that, the promised gales didn't have quite the punch we expected and have treated us quite gently, although there were power cuts in other parts of the South-East. In the garden, the only damage from the winds seems to have been a small number of leaves torn off the Birch. All the 'sensible' ladybird larvae had found shelter and today they are back, grazing on the leaves as though nothing had happened. An event I stumbled on this morning (but a bit late in the process) was the emergence of this leaf hopper on the birch tree. I think it is the same species (Eupteryx stellulata) that I photographed back in June. They seem to be flourishing on the tree this year. First of all a near-miss. The little bug nymph with red face stripes that I photographed on the 6th has remained on the same leaf ever since, even through the gale. This morning I spotted it part way through a moult and went into the house to get my camera. Something distracted me, and I forgot all about it (!!!!!!!) 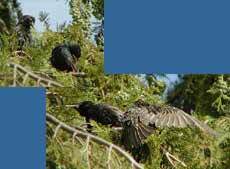 until the moult was completed. In the top image the cast skin is on the left. The dark object is the cast skin of a ladybird pupa. On another part of the Birch tree, this solitary sawfly larva has been munching away at a leaf for the last week or so. It is distinguished from a caterpillar by the large number of prolegs that it has (as opposed to the four pairs normally possessed by a caterpillar). I can't see any others on the lower branches of the tree. This is a picture that I took on the 7th (but forgot about!). On yet another Birch leaf, it is a very small individual (<4mm), and it seems to have a small, upward curved ovipositor. I can't get near to identifying it but I wonder if it could be one of the many gall wasps. 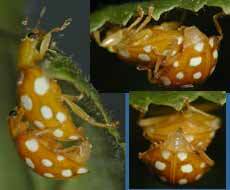 The Bamboos came up with another surprise this afternoon in the form of this Cream-spot Ladybird (Calvia 14-guttata), seen for the first time in the garden, although they are common on broad-leaved trees. 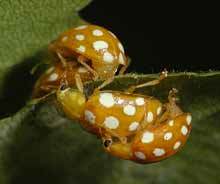 Although generally similar in colour to the Orange Ladybirds, it has a dark band over the top of the head, and the front of the thorax has an indentation around the top of the head (In the Orange Ladybird it is straight across). 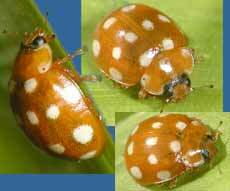 Also, as the Latin name says, it has fourteen spots, while the Orange Ladybird normally has sixteen. Back on the 25th June I included a photograph of a tiny black beetle on a Water Forget-me-not flower. At the moment there are similar beetles on many of the flowers currently in bloom in the garden. The Ragworts has now started flowering and there are none of those beetles on the flowers, but I did find this small, light brown beetle amongst the flower heads this evening. To give an idea of its size, the green part of the flower heads is just over 5mm high. Although I can't match it exactly with any of the beetles in my guide books, it certainly seems to closely resemble an abundant beetle of damp grassland and hedgerows called Microcara testacea. Over the last few years many of the Ragwort flower buds were destroyed by the larvae of a fly that laid its eggs in them. I don't see signs of similar damage this year. At 11pm, four hours after I photographed the newly emerged shield bug nymph, it now looks like this as its exoskeleton hardens and darkens. I shall check it again tomorrow morning. 10 July - We have been out all morning so that Sheila could choose a new computer to replace the unreliable old PC that she has been using for her embroidery work - this afternoon is dedicated to setting it up, so there will be little chance for photography today. I did remember to check the nymph before breakfast. It hasn't changed any more since last night. In last month's BBC Wildlife magazine there was an article about Shield Bugs, including a photograph of nymphs looking identical to this one. It appears that it could well be a Parent Bug (Elasmucha grisea). We have been seeing hedgehog droppings most days for the last few weeks and this afternoon at around 5pm we saw the culprit at last, in the deep shadows under the Hawthorn. The lighting was poor so there was no chance of a photograph. In fact, after a bright start the whole day turned dull with frequent rain in the afternoon and evening - what has happened to summer?! 16 July - Over the last week the weather has been dreary and I have hardly picked up my camera. Today has seen some improvement. It has been warmer, dry, and and we actually have partially blue skies this evening, with a touch of high cloud. I did take a couple of pictures today, of a beetle and a hoverfly, but I haven't had chance to process them as we busy packing, on the eve of heading for Cornwall again. This means another gap in the diary. I hope to add some entries while we're away, although I won't be able to upload them to the website until we get home. The long term forecast suggests that the 'Azores High' is making its way slowly towards us. That should mean better weather over the next few weeks, although our destination was shrouded in thick mist today!